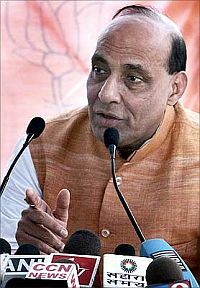 Bharatiya Janata Party president Rajnath Singh at the end of the three-day long Chintan Baithak blamed the Third Front for playing spoil sport and dividing the vote bank of the opposition parties, thereby helping the Congress to win the elections. Rajnath Singh also said on Friday that senior leader L K Advani will continue to lead the party and gave clear signals that dissent and indiscipline will not be tolerated. He said the 'Chintan baithak' discussed the Lok Sabha poll debacle but no one was held "accountable or responsible" for the defeat. "If someone is to be held accountable, I take responsibility for the defeat," Singh told a press conference at the end of conclave of top party leaders. At the outset even before the press conference began, he was asked whether Advani will continue to lead the party. "Yes, he will continue to lead the party," he replied. Asked about the Rashtriya Swayamsevak Sangha chief Mohan Bhagwat favouring younger leadership in the party, Singh said the BJP has been inducting fresh blood for a long time. "We have been doing it all the time." Asked if it was a snub to RSS chief, he just laughed away the suggestion. On ideological deviation against the backdrop Jaswant Singh episode, he said "the political ideology and thought on the basis of which the party was found, we will stick to it now and continue to do so in future. Our ideology is non- negotiable." To a question about criticism aired in public by leaders like Yashwant Sinha and Arun Shourie and whether action would be taken against them, Singh said, "What I have done, you have seen it...There will be no compromise on indiscipline." The BJP president is going to call a meeting of the senior leaders to discuss the suggestions from the state units for reasons of defeat where the leadership would discuss and plan the road ahead that would be placed before the National Executive in October for approval.